Whether you are an occasional or a regular user, STIHL's FF 1 File Holder Guide enables excellent precision, while being easy to handle with minimal effort. Designed for 1/4 inch and 3/8 inch P type saw chains. Please Note: File not included. 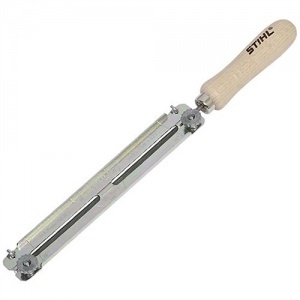 This file holder and round file kit (4.0 mm diameter) for 1/4 inch and 3/8 inch P type chains allows you to keep your saw chain in excellent condition. A complete file kit for 1/3 inch and 3/8 inch P type chains, this is the perfect addition to keep your saw chains well-maintained. 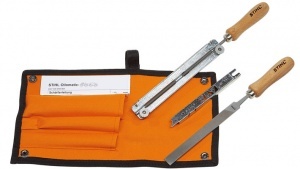 It includes a file holder with a round file, flat file and file gauge, in a sturdy case.